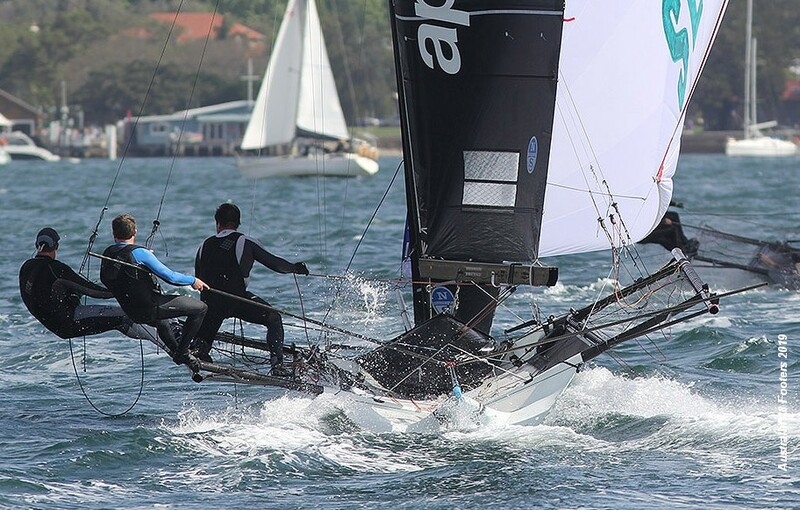 The Asko Appliances team recovered from a mid-race capsize to win the 2018-2019 Australian 18 Footers League Club Championship in a dramatic day of 18ft Skiff Racing on Sydney Harbour. Going into Sunday’s final race of the championship, Asko Appliances (James Dorron, Harry Bethwaite, Trent Barnabas) held a 3.4 points lead over arch-rival Smeg and had to finish no worse than three places behind Smeg to take their third championship title for the season, so far. In a 12-15-knot South-East breeze, Smeg grabbed an early lead while Asko Appliances was never further back than third over the first three legs of the course. Just when everything appeared to be going to the plot, Asko Appliances capsized on the tight spinnaker run from Clark Island to Chowder Bay and the team’s championship-winning hopes seemed to head out the back door as Smeg held a handy lead over Finport Finance. But the spoiler was the Winning Group team of John Winning Jr who took the lead from Smeg at Rose Bay on the final lap and finally crossed the finish line 16s ahead of Smeg. Finport Finance finished a further 39s back in third place, with Bing Lee in fourth place. While a hard-charging comeback by Asko Appliances saw them take fifth place and the championship by a mere 0.4 of a point ahead of Smeg. Next up is the JJ Giltinan (world) Championship 2 to 10 March 2019.